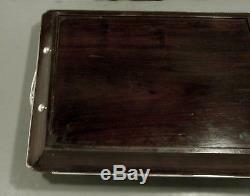 JAPANESE STERLING TEA SERVING TRAY c1890 HAND CRAFTED " MEIJI ". 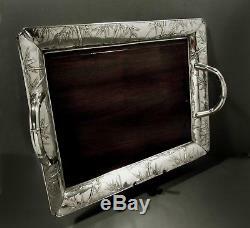 WE WILL CONTINUE OFFERING THE FINEST ANTIQUE SILVER & DECORATIVE ARTS. 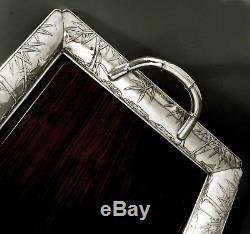 A fine and rare Japanese sterling silver tray for serving tea. Classic rectangular form with in-curved corner. Wide gently sloping sterling silver border with applied and hand. Decorated bamboo grove rising from rocky ground. Thick notched C scroll handles. Center the original wood surface. 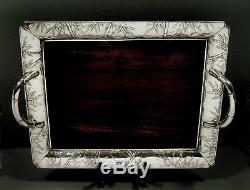 This late Meiji hand crafted Japanese sterling tray. Is 21 1/2 inches across handles and 15 3/4 wide. No weight given as center is wood. We guarantee this is Japanese sterling silver as noted. Rich sterling patina, retains original detail. Original wood center in fine state. Loss of 1 1/2 inches of side rim, see detailed images. 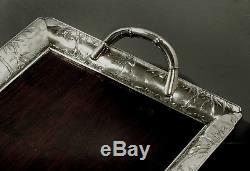 The item "Japanese Sterling Tea Set Tray c1890 HAND CRAFTED MEIJI PERIOD" is in sale since Sunday, July 8, 2018. This item is in the category "Antiques\Asian Antiques\China\Teapots". The seller is "runwithme" and is located in Worcester, Massachusetts. This item can be shipped to United States, Canada, United Kingdom, Denmark, Romania, Slovakia, Bulgaria, Czech republic, Finland, Hungary, Latvia, Lithuania, Malta, Estonia, Australia, Greece, Portugal, Cyprus, Slovenia, Japan, Sweden, South Korea, Indonesia, South africa, Belgium, France, Hong Kong, Ireland, Netherlands, Poland, Spain, Italy, Germany, Austria, Israel, Mexico, New Zealand, Singapore, Switzerland, Norway, Saudi arabia, Ukraine, United arab emirates, Qatar, Kuwait, Bahrain, Croatia, Malaysia, Brazil, Chile, Colombia, Costa rica, Dominican republic, Panama, Trinidad and tobago, Guatemala, El salvador, Honduras, Jamaica, Antigua and barbuda, Aruba, Belize, Dominica, Grenada, Saint kitts and nevis, Saint lucia, Montserrat, Turks and caicos islands, Barbados, Bangladesh, Bermuda, Brunei darussalam, Bolivia, Ecuador, Egypt, French guiana, Guernsey, Gibraltar, Guadeloupe, Iceland, Jersey, Jordan, Cambodia, Cayman islands, Liechtenstein, Sri lanka, Luxembourg, Monaco, Macao, Martinique, Maldives, Nicaragua, Oman, Peru, Pakistan, Paraguay, Reunion.